So just over a week ago, on our last night in New York, my sister and I headed off to the Brooks Atkinson Theater to watch one of the preview performances of the new musical Waitress. The musical is based on the 2006 movie penned by Adrienne Shelly, starring Keri Russell as a down and out waitress called Jenna in small town America who finds out she’s pregnant with her not-so-fabulous husband’s baby. Aside from trying not to freak out because Sara Bareilles was sat watching the show in the stalls downstairs and fangirl-ing when Jessie Mueller (who plays Jenna in the musical marvelously) came on stage, after coming out of the theatre I found myself awake with too many thoughts on what I’d watched and about women on Broadway in general. Though this season of shows seem to be an exception to the usual ‘cis-male’ narrative thanks to the likes of Hamilton, Allegiance, The Colour Purple and Shuffle Along, Broadway as an institution is still very much male-centric. And whilst this particular part of the media industry is usually perceived as more progressive than its Hollywood counterparts, only now is Waitress currently making history as the first Broadway musical headed up by an all-female creative team. In a world where women are consistently excluded from the narrative Waitress shines out like a beacon of what is possible and can be achieved if female creators are just given the chance. Director Diane Paulus is a pro at facilitating this. She already has a track record of providing Broadway with some incredible female roles, by gender bending the role of narrative Leading Player in Pippin, giving us a single mother who puts her children before anything else (even her own health and wellbeing) in Finding Neverland, and directing the powerhouse that is Audra McDonald in Porgy & Bess towards a Tony Award. In Waitress we have a story solely focused on one woman’s narrative, her struggles finding out she’s pregnant whilst in an love-less, emotionally and physically abusive relationship and falling in love with another (married) man. Her story arc is reassuringly familiar (small town girl who dreams of a better life), but by all accounts on paper, Jenna is not a good person. The song ‘She Used To Be Mine‘ sets that out plain and clear. She’s a liar, a cheater and a hypocrite, but give me a flawed character with a redemptive arc who manages to find her sense of self agency like Jenna does any day. As the song states, she’s doing her best and that’s in itself is the best she can do. That mentality and the journey to self-actualisation that she is the maker of her own destiny is ultimately what saves her. Not a dreamy doctor/alternative love interest (played in the musical by the fantastically dorky Drew Gehling) nor is it winning money in a pie making contest nor is it her equally awesome waitress friends Becky and Dawn. Jenna makes it out and takes control of her own life with her new baby in tow on her own terms no matter the cost and as she sings ‘Everything Changes‘ you feel that accomplishment. It’s invigorating and so so refreshing to watch on stage. What frames this story so well is the amount of women involved in creating this narrative. Originally written AND directed by Adrienne Shelly (a rarity in Hollywood as it stands), the movie was released posthumously after her death. The original movie was uplifting, funny and quirky, in the same vein as many of the a romantic comedy we see today. 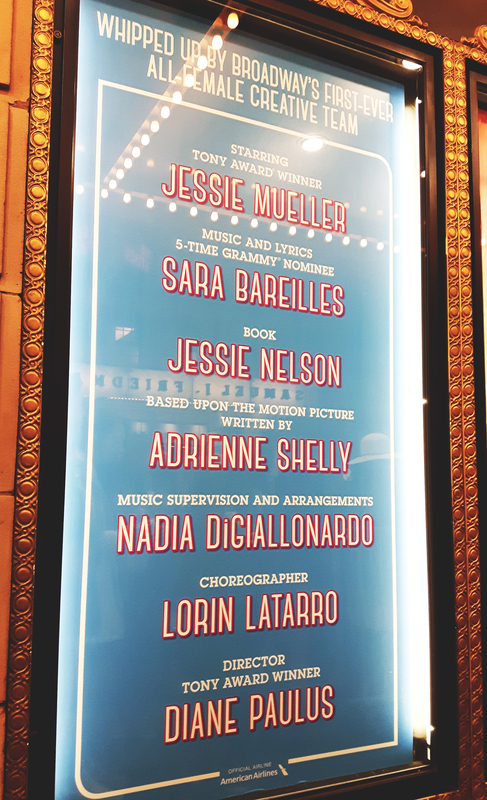 For the musical adaptation the creative team hired singer songwriter Sara Bareilles and the choice to have her pen Jenna’s inner thoughts is a stroke of genius. If there was anyone who can nail the inner turmoil and complicated nature of women it would be Sara, who’s music has garnered her 5 Grammy Award nominations. Littered around the crew are countless other women, including book writer Jessie Nelson and choreographer Lorin Latarro. And as I mentioned, backing up Jessie Mueller in the lead role are sharp tongued Keala Settle and adorably dorky Kimiko Glenn as Jenna supportive friends. I keep mentioning the rarity that a show like this comes along, but it’s so true. 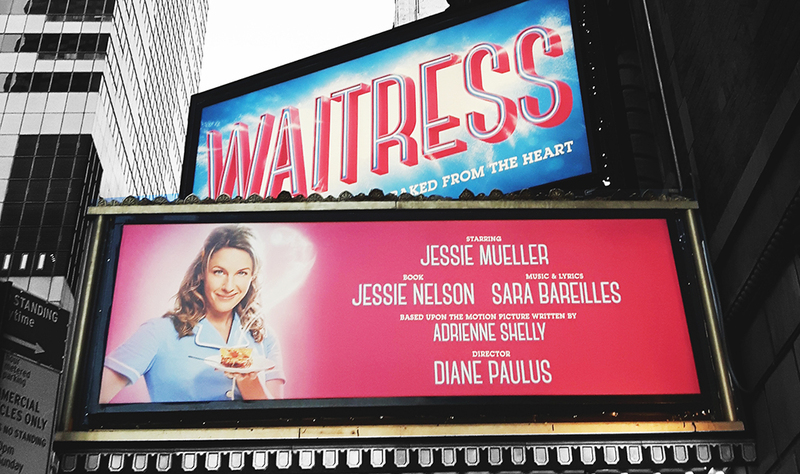 As Waitress so wonderfully demonstrates there is no disadvantage to letting women take the reigns in a production. Women aside the show itself is so much fun, wonderfully witty and ultimately heartwarming all centered around a story about a woman you really root for by the end. *not sponsored (I wish!) just a fan who adored everything about this wonderful show.